Since the 2015 Paris Agreement to limit warming of the average surface air temperature to 2.0 degrees C, with a stated ambition to limit warming to 1.5 degrees C, there has been a lot of research of what is needed to make the Paris goals possible. (For example, What would it take to achieve the Paris temperature targets?). What is clear is that meeting the goals of Paris is tough. It is social engineering and geoengineering at a level that is, to me, incomprehensible. We will, ultimately, have to learn to take carbon dioxide out of the atmosphere – as well as to adapt. The scenarios that allow us to meet Paris goals are complex.They are a combination of complexity, uncertainty, and unlikelihood that they are a communication nightmare. They help us think about things, but they do not prescribe how to address climate change. Here is the original article from The Conversation. Best-case scenario, how much are we locked into? Earth’s climate is changing rapidly. We know this from billions of observations, documented in thousands of journal papers and texts and summarized every few years by the United Nations’ Intergovernmental Panel on Climate Change. The primary cause of that change is the release of carbon dioxide from burning coal, oil and natural gas. One of the goals of the international Paris Agreement on climate change is to limit the increase of the global surface average air temperature to 2 degrees Celsius, compared to preindustrial times. There is a further commitment to strive to limit the increase to 1.5℃. Earth has already, essentially, reached the 1℃ threshold. 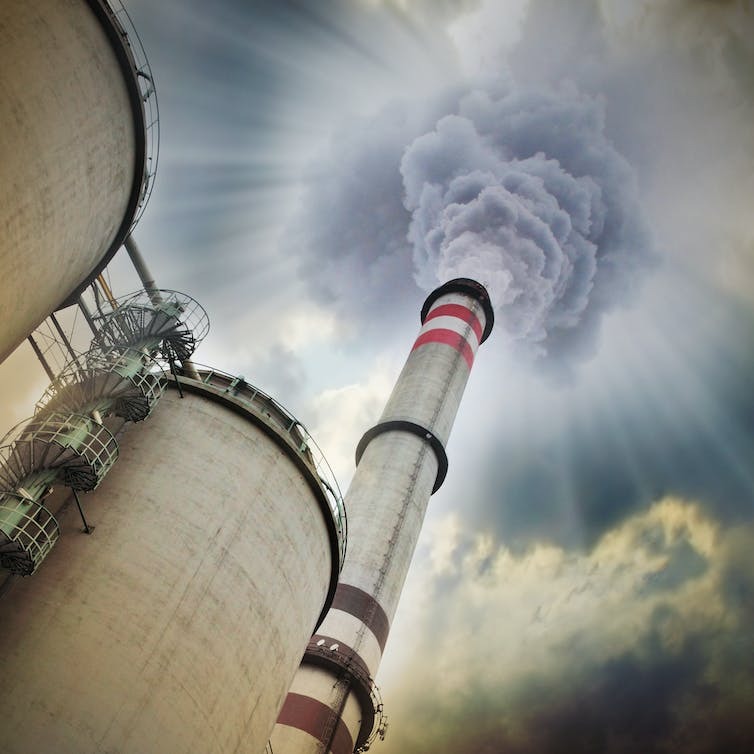 Despite the avoidance of millions of tons of carbon dioxide emissions through use of renewable energy, increased efficiency and conservation efforts, the rate of increase of carbon dioxide in the atmosphere remains high. International plans on how to deal with climate change are painstakingly difficult to cobble together and take decades to work out. Most climate scientists and negotiators were dismayed by President Trump’s announcement that the U.S. will withdraw from the Paris Agreement. 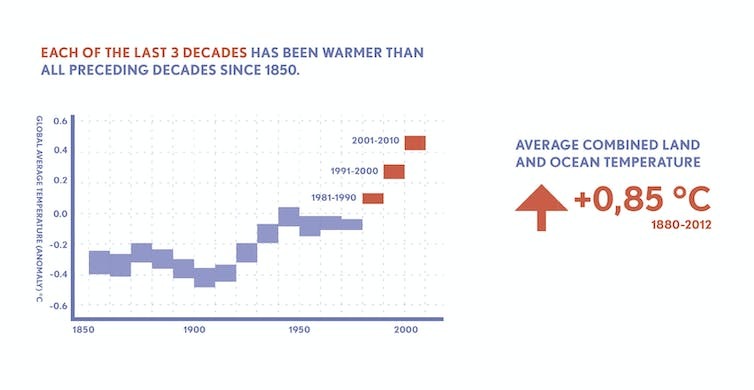 Since 1880, after carbon dioxide emissions took off with the Industrial Revolution, the average global temperature has increased. With the help of internal variations associated with the El Niño weather pattern, we’ve already experienced months more than 1.5℃ above the average. Sustained temperatures beyond the 1℃ threshold are imminent. Each of the last three decades has been warmer than the preceding decade, as well as warmer than the entire previous century. The North and South poles are warming much faster than the average global temperature. Ice sheets in both the Arctic and Antarctic are melting. Ice in the Arctic Ocean is melting and the permafrost is thawing. In 2017, there’s been a stunning decrease in Antarctic sea ice, reminiscent of the 2007 decrease in the Arctic. A massive iceberg – estimated to be 21 miles by 12 miles in size – breaks off from Antarctica’s Pine Island Glacier. The simple answer is no. Once we release the carbon dioxide stored in the fossil fuels we burn, it accumulates in and moves among the atmosphere, the oceans, the land and the plants and animals of the biosphere. The released carbon dioxide will remain in the atmosphere for thousands of years. Only after many millennia will it return to rocks, for example, through the formation of calcium carbonate – limestone – as marine organisms’ shells settle to the bottom of the ocean. But on time spans relevant to humans, once released the carbon dioxide is in our environment essentially forever. It does not go away, unless we, ourselves, remove it. In order to stop the accumulation of heat, we would have to eliminate not just carbon dioxide emissions, but all greenhouse gases, such as methane and nitrous oxide. We’d also need to reverse deforestation and other land uses that affect the Earth’s energy balance (the difference between incoming energy from the sun and what’s returned to space). We would have to radically change our agriculture. If we did this, it would eliminate additional planetary warming, and limit the rise of air temperature. Such a cessation of warming is not possible. This decades-long lag between cause and effect is due to the long time it takes to heat the ocean’s huge mass. The energy that is held in the Earth by increased carbon dioxide does more than heat the air. It melts ice; it heats the ocean. Compared to air, it’s harder to raise the temperature of water; it takes time – decades. However, once the ocean temperature is elevated, it will release heat back to the air, and be measured as surface heating. Scientists run thought experiments to help think through the complex processes of emissions reductions and limits to warming. One experiment held forcing, or the effect of greenhouse gases on the Earth’s energy balance, to year 2000 levels, which implies a very low rate of continued emissions. It found as the oceans’ heating catches up with the atmosphere, the Earth’s temperature would rise about another 0.6℃. Scientists refer to this as committed warming. Ice, also responding to increasing heat in the ocean, will continue to melt. There’s already convincing evidence that significant glaciers in the West Antarctic ice sheets are lost. Ice, water and air – the extra heat held on the Earth by carbon dioxide affects them all. That which has melted will stay melted – and more will melt. In any event, it’s not possible to stop emitting carbon dioxide right now. Despite significant advances in renewable energy sources, total demand for energy accelerates and carbon dioxide emissions increase. As a professor of climate and space sciences, I teach my students they need to plan for a world 4℃ warmer. A 2011 report from the International Energy Agency states that if we don’t get off our current path, then we’re looking at an Earth 6℃ warmer. Even now after the Paris Agreement, the trajectory is essentially the same. It’s hard to say we’re on a new path until we see a peak and then a downturn in carbon emissions. With the approximately 1℃ of warming we’ve already seen, the observed changes are already disturbing. If we stop our emissions today, we won’t go back to the past. The Earth will warm. And since the response to warming is more warming through feedbacks associated with melting ice and increased atmospheric water vapor, our job becomes one of limiting the warming. If greenhouse gas emissions are eliminated quickly enough, within a small number of decades, it will keep the warming manageable and the Paris Agreement goals could be met. It will slow the change – and allow us to adapt. Rather than trying to recover the past, we need to be thinking about best possible futures. This article was updated on July 7, 2017 to clarify the potential effects from stopping carbon dioxide emissions as well as other factors that affect global warming.